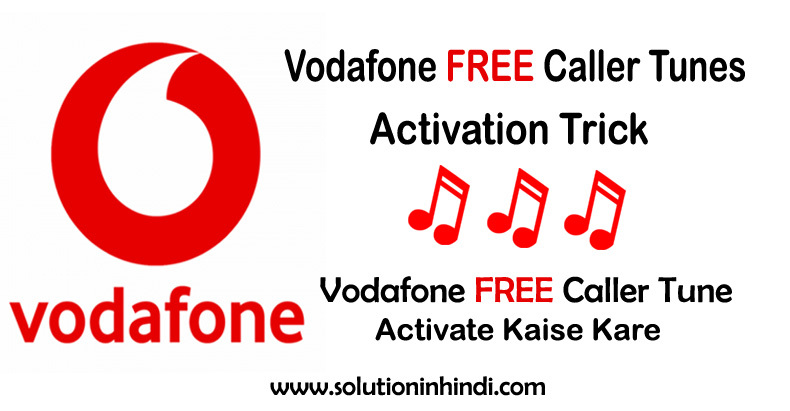 Vodafone FREE Caller Tune Activate Kaise Kare 2018: Yedi aap Vodafone customer hai. Aur chahte ho Vodafone free caller tunes activation trick. Toh aap bilkul sahi jagah par aaye hai. Vodafone apne customers ko de rahe hai free me caller tune. Isse apko 1 Rupee bhi nahi lage. Aaj main apko 3 easy trick bataunga. Jisse aap bhut hi asani se. Apke Vodafone mobile number me free caller tune activate kar sakte ho. Smartphone with Vodafone user. And other sahi mobile ke liye. Matlab aap agar keypad mobile use kar rahe ho. Tab bhi Vodafone free caller tune set kar sakte ho. Toh chale jante hai. How to Activate Vodafone Free Caller Tune In Hindi. Free Vodafone caller tune activation karne ke liye. Niche 3 tricks step-by-step bataye gaye hai. Pehle 3 method ko acche se padhe, Samjhe phir activate kare. Tension ki koy baat nahi hai. Main khud use kiya hu. 3no Tricks totally free hai. Phir bhi aap chahe to Vodafone Customer care (198) se baat karke doubt clear kar sakte ho. Note: Agar Aap Airtel User Bhi Hai. Toh Yaha Se Airtel FREE Caller Tune Activate Kare 999 Days Ke Liye. Mobile Me Message Box Open Kare. Now, ‘56789’ Par ‘CT 7907360’ Type Karke Message Send Kare. All Done! Enjoy Free Caller Tune Successfully Activated Ho Chuka Hai. Vodafone caller tune bhut hi easy trick hai activate karna. Vodafone free caller tune and Hello tune trick 100% free for users. This Vodafone hack tune offer is valid for all users. Pehle Mobile Me Message Inbox Open Kare. Now Type ‘CT 8894702’ and send it to ‘56789’ – English Caller tune ke liye. And Type ‘CT 8894716’ to ‘56789’ – for Hindi Caller tune. All Done! Your Caller tune is successfully activation. Sabse Pehle Playstore Se Wring App Download Kare. Ab, Install and Open Wring App. Now Set up Your Call Me Tunes. Mobile Number Enter Kare and Sabhi Details Ko fill Kare. Caller Tune Song Choose Kare. All Done! Free Caller Tune Successfully Activated Ho Gaye Hai. Ab ‘144’ Me ‘CAN CT’ Type Karke SMS Send Kare. Bataye gaye 3 tricks sabse easy and totally free hai. Aap isse bhut hi asani se apke ‘Vodafone Me Caller Tune Kaise Lagaye‘ sakte hai. Agar apko kahi kisi tricks me problem ho toh niche comment karke hame jarur bataye. Aur Caller tune Deactivate karne ke liye. ‘CAN CT’ Type Karke ‘144’ Me SMS Send Karna hoga. Ummid karta hu. ‘Vodafone FREE Caller Tune Activate Kaise Kare‘ Puri jankari details me mil gaye honge. Agar apko ye triks helpful laga ho. Toh apke friends ke sath. Social Media par share jarur kare.